Both are capable of sending high-def video and audio from a source device to a display. So what's the difference? The HDMI audio/video interface standard is everywhere. You’ll find the connection in TVs, set-top boxes, Blu-ray players, A/V receivers, gaming consoles, camcorders, digital cameras, and even some smartphones. You’ll also find an HDMI port in most consumer desktop and laptop computers. No modern all-in-one is complete without an HDMI input that allows you to connect a gaming console or a set-top box to the computer so you can use its display for a second purpose. But given HDMI’s ubiquity, you might have forgotten the other digital audio/video standard: DisplayPort. Though you’ll find it alongside HDMI in many late-model, add-in video cards, as well as in laptops marketed to business users, it rarely appears in Windows PCs aimed at consumers. Both HDMI and DisplayPort can send high-definition digital video and audio from a source device to a display. So what’s the difference? We’ll answer that question, starting with a review of how the two standards came to be, and what entities control them. The HDMI (High Definition Multimedia Interface) specification was conceived more than 10 years ago by six consumer electronics giants: Hitachi, Panasonic, Philips, Silicon Image, Sony, and Toshiba. Today, HDMI Licensing, LLC, a wholly owned subsidiary of Silicon Image, controls the spec. Manufacturers must pay a royalty for including HDMI into their products. The DisplayPort specification was developed by, and remains under the control of, the Video Electronics Standards Association (VESA), a large consortium of manufacturers ranging from AMD to ZIPS Corporation. DisplayPort debuted in 2006 as part of an effort to supplant the much older VGA (Video Graphics Array, an analog interface first introduced in 1987) and DVI (Digital Video Interface, introduced in 1999) standards used primarily for computer displays. DisplayPort is a royalty-free product. Fun fact: Of the six companies responsible for the creation of HDMI, only Hitachi and Philips are not also member companies of VESA. HDMI connectors have 19 pins and are most commonly seen in three sizes: Type A (standard), Type C (mini), and Type D (micro). Of these, Type A is by far the most common. A fourth category of HDMI connector, Type E, is used for automotive applications. Most HDMI connectors use a friction lock, meaning that a tight fit keeps the plug mated to the socket, but some vendors have developed proprietary locking mechanisms designed to prevent the cable from pulling loose. The three types of HDMI connectors you’re most likely to encounter are (from left to right) standard, mini, and micro. A fourth connector type, for automotive applications, is not shown here. DisplayPort connectors have 20 pins and are available in two sizes: DisplayPort and Mini DisplayPort (the latter is the port of choice for Microsoft’s Surface Pro tablet). Find one on Amazon. Interestingly, Intel’s Thunderbolt interface combines the features of Mini DisplayPort and adds PCI Express data connections—but that’s beyond the scope of this article. Though most full-size DisplayPort connectors have a locking mechanism that prevents them from being disconnected accidentally, the official spec does not require that feature. You’ll find HDMI Type D micro connectors on some smartphones and tablets, but no manufacturer aside from Microsoft puts even Mini DisplayPort on its handheld devices. The locking connector common to full-size DisplayPort connectors, on the other hand, is a great feature that appears on only a few HDMI Type A cables. The biggest problem with HDMI cable standards is that there are four of them currently, with a fifth standard on the way to accommodate the recently released HDMI 2.1 spec. Many, many older cables are not adequately labeled to identify their capabilities. Using an HDMI cable that isn’t up to a particular task can yield problems including visual and audio glitches, artifacts, and audio/video synchronization problems. Here are details on the four current types of HDMI cables. Find one on Amazon. Standard HDMI Cable: Provides sufficient bandwidth for only 720p and 1080i resolution video. Standard HDMI Cable with ethernet: Has the same bandwidth, but adds support for 100Mbps ethernet. High Speed HDMI Cable: Provides more bandwidth, and can carry video with a resolution of 1080p or higher (up to 4096x2160, or 4K, but at a maximum refresh rate of just 24Hz, which is fine for movies, but terrible for games). This type of cable can also handle 3D video. High Speed HDMI Cable with ethernet: Supports the same resolutions as High Speed HDMI Cable, as well as 3D, and adds support for 100Mbps ethernet. 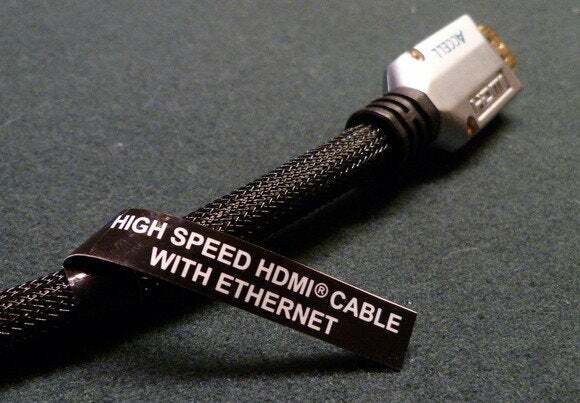 Be sure to buy High Speed HDMI Cable connectors if you intend to send 1080p, or greater, video from your PC or Blu-ray player to a display (ethernet is optional). The HDMI specification doesn’t define a maximum cable length, nor does it state what type of material HDMI cables should be composed of. Copper wire is the most common material, but HDMI signals can also be run over CAT 5 or CAT 6 cable (for distances of up to 164 feet), over coaxial cable (for up to 300 feet), or over fiber (for more than 328 feet), according to HDMI Licensing LLC. “Active” HDMI cables have integrated circuits embedded in the cable to amplify the signal. Active cables can be longer and thinner than passive cables (thinner cables are less likely to fail when forced to make hard bends). DisplayPort cables are much simpler to define: There’s just one type! (Available here on Amazon.) The current version, DisplayPort 1.3, delivers enough bandwidth to carry video resolutions of up to 3840x2160 pixels at a refresh rate of 60Hz, and it supports all common 3D video formats. DisplayPort cables can also carry multichannel digital audio. On the other hand, DisplayPort can’t carry ethernet data, and the standard doesn’t have an audio return channel. The two types of DisplayPort connectors are Standard and Mini. With the addition of a simple adapter, a DisplayPort cable can connect a DisplayPort source to a VGA display (which is very useful when you need to connect your laptop to an older video projector). 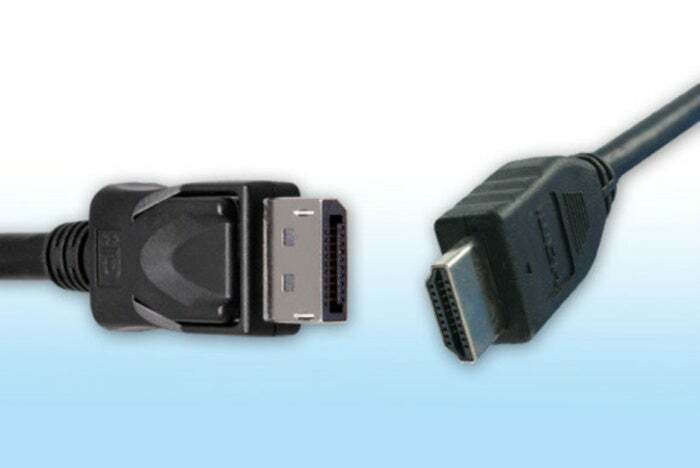 Adapters are also available to connect a DisplayPort source to a single-link DVI or HDMI display. (DisplayPort adapters available here on Amazon.) HDMI cables can be connected to a DVI interface using an adapter (available here on Amazon), but that’s it. A passive copper DisplayPort cable can support extremely high data rates (a video resolution of up to 3840x2160) over a length of 6.5 feet. If you want to run a passive copper DisplayPort cable as long as 50 feet, the standard says you’ll be limited to 1080p resolution—but the spec is conservative, and in practice that 50-foot cable can carry enough data to support resolutions as high as 2560x1600 (sufficient for a 30-inch display). An active copper DisplayPort cable, which draws power from the DisplayPort connector to operate a signal amplifier embedded in the connector, can carry video with a resolution of 2560x1600 over a 65-foot cable. Finally, fiber DisplayPort cables can be hundreds of feet long. HDMI can handle a single video stream and a single audio stream, so it can drive only one display at a time. That’s fine if you use a single monitor or a TV, but many people use more than one display these days. These use cases aren’t limited to stockbrokers keeping one eye on a ticker and the other on news headlines, either. Many gamers use two or more monitors simultaneously. And once you become accustomed to having multiple screens on your desk, you won’t want to go back. A single DisplayPort interface can support up to four monitors at 1920x1200-pixel resolution each, or two monitors at 2560x1600-pixel resolution, with each display receiving independent audio and video streams. And since some GPUs can support multiple DisplayPort interfaces, you can daisy-chain compatible monitors to connect as many as six displays to one source. Which display interface is best? HDMI was designed primarily for consumer-electronics applications: Blu-ray players, TVs, video projectors, and the like. Despite the confusing cable specifications, it does things that DisplayPort can’t. Meanwhile, VESA designed DisplayPort to be the ultimate display interface for computers, so it complements rather than replaces HDMI. Unfortunately, many computer manufacturers—especially those building consumer laptops and all-in-ones—seem to have decided that HDMI is enough. Here’s hoping that this attitude changes, because DisplayPort offers at least as much to consumers as it does to business users. HDMI isn’t going anywhere, and we wouldn’t want it to, but it’s time for computer manufacturers to show DisplayPort some love, too. As we said at the outset, HDMI is ubiquitous. It will appear in just about any TV you might consider buying, and it will be included in every consumer-oriented computer display. It should also be present in most video cards, in laptop and desktop PCs, and (as an input, at least) in every all-in-one PC. Better desktop displays, desktop PCs, and all-in-one PCs will support DisplayPort in addition to HDMI. Laptops, however, have less real estate available for connectors. For the most part, consumer laptops will provide HDMI, while business-oriented models will support DisplayPort. If you plan to use a laptop with a stand-alone display, you won’t regret paying a little more to get a model that offers DisplayPort: Its support for multiple displays and its ability to connect to nearly any other type of monitor with an inexpensive adapter give it greater flexibility than HDMI possesses. Editor’s note: If you enjoyed this article, you might also be interested in reading this story about DisplayPort’s new multi-streaming feature.